How Do You Feel On Sunday Nights? The answer was something we can all relate to -- he felt a little apprehensive and anxious on Sunday nights. Next, his mentor asked, "Bob, while coaching at Princeton, how did you feel on Sunday nights?" Pure joy. Complete excitement. Living life to the fullest. Spending time with family and friends. Playing soccer and squash. Bob Callahan, a squash star as a student at Princeton University (he was a 2x All-American, captain, and 3x National Champion), left the comfortable confines of Princeton, NJ in the spring of 1977 to enter the corporate world. An economics major at Princeton, he accepted an offer to join IBM -- the most exciting technology company of the time. The job began with an extensive training program aimed to sharpen and refine the technical knowledge and sales skills of the top young graduates it employed. It was during the training that Bob met his wife Kristen. Wasting no time with the courtship, they married in September 1978. Just a few years later, back on the Princeton Campus the athletic department was in search of a new head squash coach after coach Norm Peck retired in 1981. Bob was living in North Jersey with Kristen, both enjoying life and work, and agreed to join the search committee. As the search dragged on and the 1981-1982 season approached, the committee realized it would need someone to step in. A fellow committee threw out a long shot -- "Bob, why don't you coach the team for the next year? You can just do it for the year which will give us more time to find a permanent solution." Things were going well at IBM. Bob and Kristen were happily married and excited to be making money so they could pay off student loans, buy a house, and get ready to start a family. Walking away from IBM would not be easy, even if just for a year. After much deliberation and the blessing of an understanding boss at IBM, Bob agreed to take a one-year sabbatical to coach the team. He figured "What's to lose? This will just be a one-year leave and a great opportunity to give back to the Princeton Squash program that gave him so much during his four years on campus." As fate would have it, the 1981-1982 Princeton Squash team under interim coach Bob Callahan went undefeated and won the Ivy League Championship and National Championship. Not a bad way to spend a sabbatical! The winning was great, but regardless of the on-court success, it was clear to everyone associated with the program that they had found something special in Bob. He was a great player and proved to be a fantastic coach. But he was also more than that. 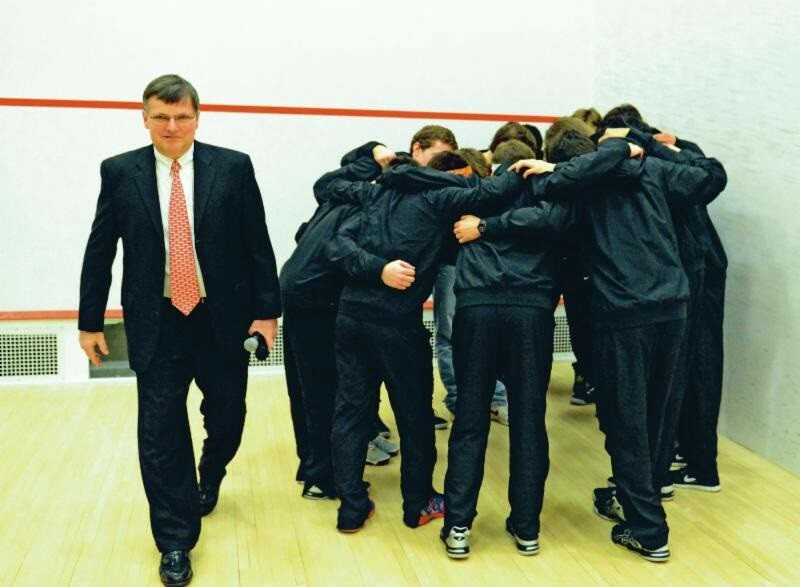 He was a leader, a teacher, and someone who understood that he could teach his players the game of squash and as time would tell, much, much more. The committee recognized this and urged Bob to stay on as the full-time coach. The offer was flattering, but it was never the plan. Bob and Kristen had set up a life together. By now, they had a baby, purchased a home, wanted a good income and security -- both of which IBM seemed to provide -- and looked forward to a great careers at IBM. However, as the days wore on and Bob's first day back at IBM drew closer, he grew a little anxious. Was going back to IBM definitely the right choice? It was the safe choice. The beaten path. But perhaps that didn't make it the right choice for him. Bob decided to give the Princeton offer some real thought. He recalls a specific conversation he had with his mentor at the time. His mentor asked him, "Bob, while you were working for IBM, how did you feel on Sunday nights?" The answer was something we can all relate to -- he felt a little apprehensive and anxious on Sunday nights. Next, his mentor asked, "Bob, while coaching at Princeton, how did you feel on Sunday nights?" Pure joy. Complete excitement. Eager for Monday morning. At that moment, Bob knew what the right choice for him was. He'd take the risk and accept the offer to coach the Princeton Squash team. Thirty-one years later, Bob retired from Princeton with ten more Ivy League titles, three more National Championships, and 305 more wins to his name. A Hall of Famer, Bob had one of the most successful college coaching careers in any sport. However, his biggest victories won't be found in the record book. His more cherished accolades are the thousands of testimonials from former players who speak and remember Bob as more than coach. Former player Yasser El Halaby '06 (a 4x National Champion) describes Bob's essence well, "Playing for Coach Callahan's team is a privilege that one recognizes after the first few team training sessions but only truly understands with time... I have a tremendous respect for a one-in-a-million individual who exudes kindness, generosity and character integrity. The many lessons I have learned and continue to learn from Coach Callahan are not restricted to the game of squash, but encompass all aspects of life." Bob left the world too early in January 2015 after a three-year battle with a brain tumor. He left his mark on the game and a legacy that lives on. All who knew Bob are glad he knew When to Jump.